The oil is pressed from the seeds found in the fruits and are extremely rich in omegas 3, 6 and 9. Omega 3 can be almost 50% and thought to be one of the richest sources of this fatty acid and such a fatty acid profile is rarely found in other oils. The omega 6 content can be up to almost 40%. It also contains high levels of vitamins A and E (alpha-tocopherol), which gives it extraordinarily strong antioxidant properties, so has a long shelf life, despite it being so high in Omega 3. It also has a very rich protein content. 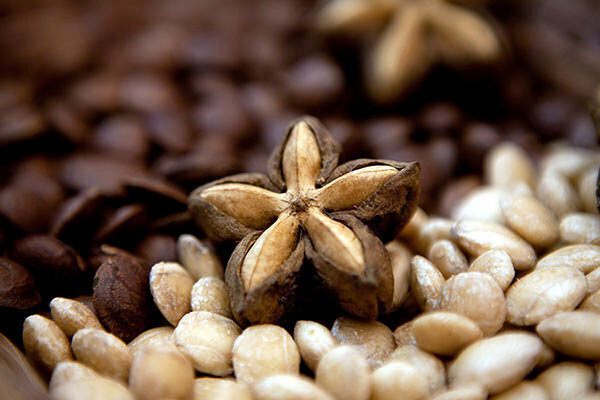 Sacha Inchi is said to be an excellent choice for problem, spot-prone skin, due to the rich presence of retinol (vitamin A) to help restore balance. The antioxidant properties make it a good indication for mature skin with fine lines. It is an exceptional emollient and can be useful for very dry skin, to help retained natural moisture levels in the tissues. The high omega 3 content can be useful in helping to calm and soothe the irritations of itchy, flaky or sensitive skin. It is a particularly useful oil to use in hair and scalp products, especially where the hair is dry, brittle or damaged.